Chattanooga Mayor Andy Berke speaks Wednesday, Aug. 23, 2017, during the annual Chattanooga Chamber of Commerce Meeting at the Chattanooga Convention Center. Economist Arthur Laffer was the keynote speaker during the event. 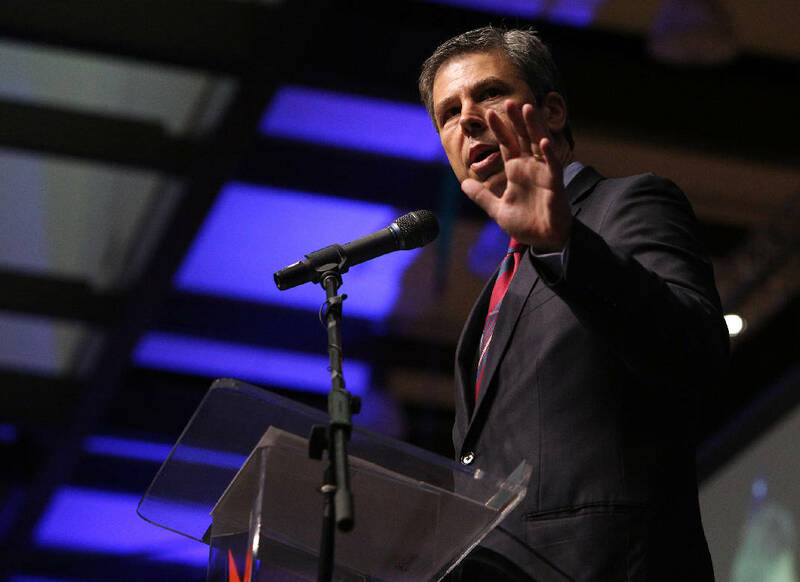 NASHVILLE — Chattanooga Mayor Andy Berke said Wednesday he's weighing a Democratic bid for the U.S. Senate seat held by U.S. Sen. Bob Corker, R-Tenn., who announced Tuesday he would not seek re-election. "I've been hearing from Tennesseans who want to see progress instead of stalemate, unity rather than division, and a leader with a proven record of accomplishment," Berke said in a statement. He added that in coming weeks, "I'll be talking with my family and people around the state to determine how I can best serve our community." Meanwhile, former NFL and University of Tennessee star quarterback Peyton Manning moved Wednesday to quash speculation he might enter the Senate Republican primary. Tennessee State Democratic Caucus Senator Jeff Yarbro talks with editors and reporters Thursday, August 13, 2015 at the Chattanooga Times Free Press. Tennessee Gov. 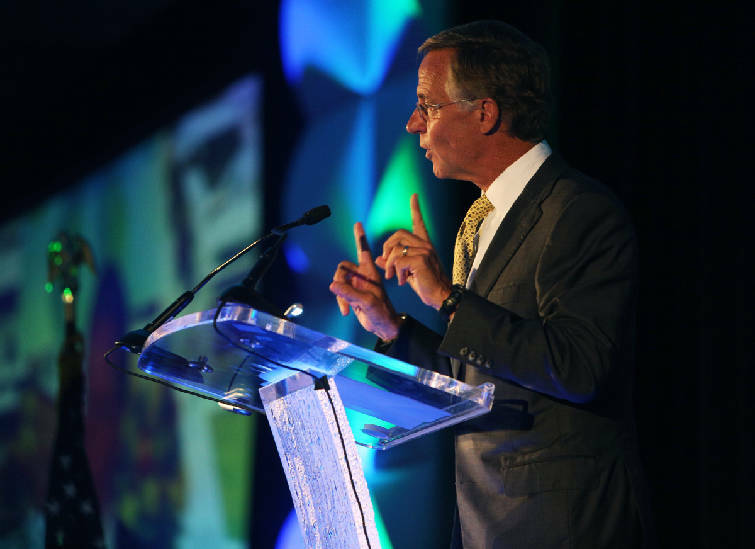 Bill Haslam speaks during the 76th annual Meeting and Luncheon of the Chattanooga Convention and Visitors Bureau at the Chattanooga Convention Center Wednesday, Sept. 20, 2017, in Chattanooga, Tenn. Haslam talked about the tourism and hospitality industry's force as an economic driver throughout Hamilton County and Tennessee. 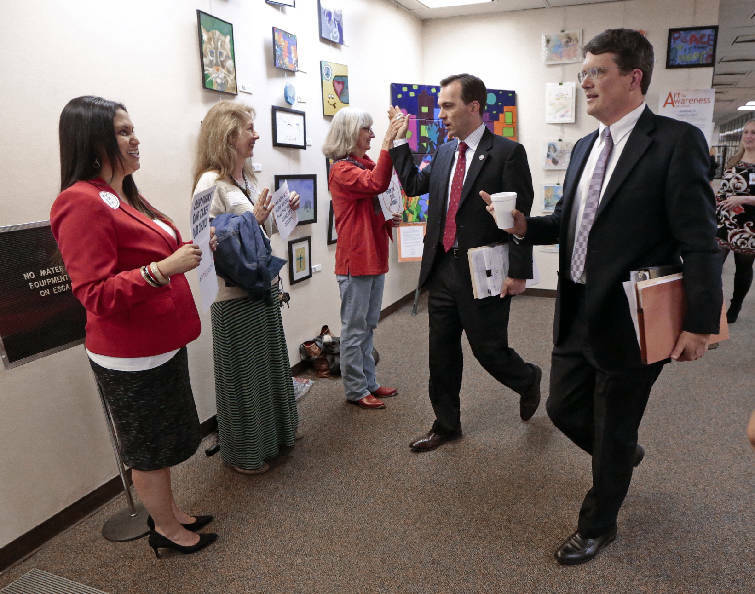 Rep. Mike Stewart, D-Nashville, right, and Rep. John Ray Clemmons, D-Nashville, second from right, pass people protesting a bill allowing guns in parks before a House season Monday, April 6, 2015, in Nashville. Berke, a former state senator, is in his second and final term as mayor. A prodigious fundraiser, he has long harbored statewide ambitions. There is already one official Democratic candidate: Nashville attorney and Iraq war veteran James Mackler, who announced earlier this year. Three other Nashville Democrats have said they are interested now that Corker, who was expected to face a tough GOP primary, has said he isn't running. 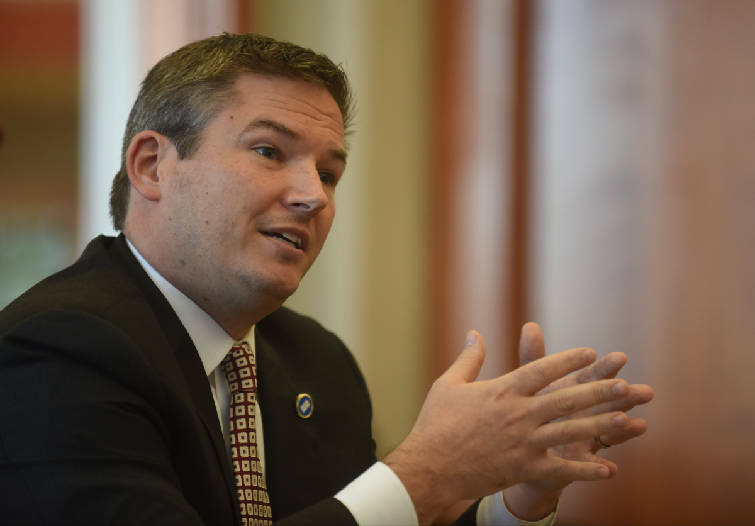 The Nashville Post reported Wednesday that state Sen. Jeff Yarbro, D-Nashville, and state Rep. John Ray Clemmons, D-Nashville, are giving the contest a look-see. And The Tennessean newspaper in Nashville reported that multimillionaire businessman Bill Freeman, who spent $4.5 million on an unsuccessful Nashville mayoral bid, is weighing running. On the Republican side, Andy Ogles, former executive director of the billionaire Koch brothers-supported Americans for Prosperity Tennessee chapter, declared his candidacy last week. It's unclear whether term-limited Gov. Bill Haslam might seek the seat, though Corker hinted to D.C. reporters Wednesday it wouldn't surprise him. U.S. Rep. Marsha Blackburn, R-Tenn., said Wednesday she is weighing a bid and plans to make a decision within a week. Former U.S. Rep. Stephen Fincher, R-Tenn., is considering running as well, The Tennessean reported. Corker helped fuel talk of a Manning run, saying he spoke with Manning earlier Wednesday and adding that while he didn't think it was likely right now, he did believe it was "possible." Manning would be "great in public office," Corker said. But Knoxville's WBIR-TV cited a report from Nashville sports talk radio show 3HL where Manning appeared Wednesday. Asked if he were entertaining a Senate run, Manning replied, "I certainly have interest in politics and in our country. I just have zero interest in being a politician," 3HL tweeted. Others looking at the contest include former state Rep. Joe Carr, R-Lascassas, and state Sen. Mark Green, R-Ashland City, who might also be drawn by the vacancy in the 7th Congressional District should Blackburn run for Senate, Republicans say. Tennessee Democrats haven't won a U.S. Senate race since 1990 when Al Gore Jr. won re-election. And now considering entering this maelstrom is Berke, 49, who served in the Tennessee Senate from 2007 to 2012. He didn't seek re-election after Republicans dramatically redrew his district in 2012. Instead, he ran for and won the office of Chattanooga mayor in 2013 and was re-elected this year with some 65 percent of the vote. Opponents believe Berke still has his eye on statewide office. In 2016, Berke was engulfed in an uproar when the husband of his top aide, Lacie Stone, charged his wife was having an affair with Berke. The mayor strongly denied the allegation, which Bobby Stone made when he was arrested on domestic violence charges. Lacie Stone called the affair allegations bogus as well. Prosecutors wound up dropping the charges against Bobby Stone. The couple divorced and she left the mayor's office. 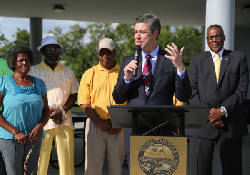 When he ran for re-election, Berke cited as accomplishments working with companies such as Volkswagen to boost Chattanooga's economy as well as developers to bring "quality, affordable housing to our community." He worked with local churches on a citywide early education reading initiative and with nonprofits to open a Family Justice Center to support victims of domestic violence. He said violent crime and property crimes fell during his first four years. Still, in a city sometimes convulsed by criminal gang gun battles in public, Berke acknowledged that "before us now is the scourge of gun violence" and vowed to address it. In announcing his decision Tuesday, Corker, Senate Foreign Relations Committee chairman, said that when he ran for the Senate in 2006, "I told people that I couldn't imagine serving for more than two terms." He acknowledged that serving as chairman of the Foreign Relations Committee and having significant influence made the decision difficult, but added that he has always thought of himself as a "citizen legislator" who was valued and valuable because of his independence. He has been close at times with President Donald Trump, who considered him as a running mate and for secretary of state. But Corker's public criticisms of Trump's remarks following a Charlottesville, Va., gathering of white nationalists and neo-Nazis and where a counterdemonstrator was killed and 19 others injured drew pointed rejoinders from both the White House and Trump. 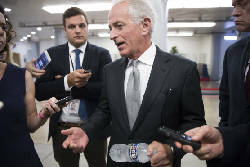 Corker said the two were blunt with each other but got along well, and Corker's campaign said the president asked him to run for re-election. But Trump's former White House strategist, Steve Bannon, was actively seeking an opponent for Corker. And Bannon's alt-right news website, Breitbart News, has been running articles lambasting Corker over one of his business dealings. In his interview with D.C. reporters Wednesday, Corker didn't absolutely rule out swapping jobs with Haslam. Asked about possibly running for Tennessee governor, Corker said if that were so he should have started about a year ago. "It doesn't seem to me that's something to think about, but over the course of the next 15 months, who knows what might happen?" he said.